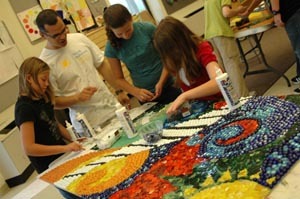 Design a ceramic quilt using mixed media techniques as a tool to discover individual roots, appreciate classroom diversity and richness. The theme of the mural is unique to every group of students. The final product is a public art mural that demonstrates the value and beauty of each individual’s contribution to our diverse society. Material fee determined by project.